Sonic will be slinging $1 Chili Cheese Coneys and All-American Hot Dogs all day on Thursday, August 25, 2016. The deal is good at participating locations with a limit of five discounted hot dogs per customer, while supplies last. The offer only applies to 6-inch versions of the hot dogs and not the foot-long varieties. 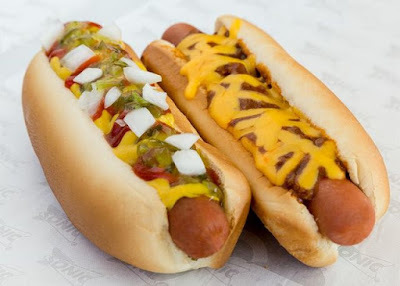 Sonic's All-American Hot Dogs feature a grilled all-beef hot dog topped with ketchup, yellow mustard, relish, and chopped onions on a hot dog bun. The Chili Cheese Coney offers the same bun and hot dog, but comes topped with warm chili and melted cheddar cheese.